Kaye Ballard, acting as a comedian, actress and nightclub performer included well-regarded runs in "The Golden Apple" and "Carnival!" On Broadway and a classic turn as a television mother-in-law, died on Tuesday at her home in Rancho Mirage, Calif. She was 93. Ms. Ballard was not a top-flight singer, and Oscar-caliber actress or a drop-dead beauty – she once played one of Cinderella's ugly stepsisters – but she made up for any shortcomings with a determination and a sheer love of performing. Even after she became well known, Ms. Ballard was not taking part in touring shows and regional theaters, and she ran the nightclub circuit for years, though she found the pace exhausting. In 2000, a mid-70s, she brought a cabaret show to Arci's Place in Manhattan called "Another Final Farewell Appearance," but there was nothing final about it: Later in the decade she was still hard at work, including in tours of "The Full Monty" and "Nunsense." For the last 40 years or so of her performing career, wherever she was appearing people would mention one particular item from her lengthy résumé: "The Mothers-in-Law," and NBC sitcom in which she and Eve were born neighbors whose children were married, turning the newly minted mothers-in-law into partners in communication. Arden's character was a haughty upper-crust type; Ms. Ballard's was brassy and very Italian. 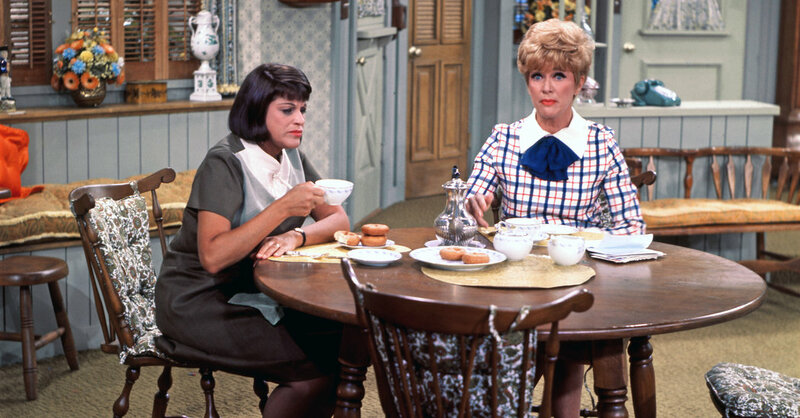 The show made its debut in 1967, and, as with many sitcoms in that era of only three networks, its characters are in the public consciousness with a disproportionate vigor: The series lasted only two seasons, but the mother-in-law personas acquired a certain immortality. "The show was just long enough to typecast me as a loudmouth Italian actress, but not long enough to ensure that I would earn the child of money where I wouldn't have to worry about being typecast, "Ms. Ballard said in "How I Lost 10 Pounds in 53 Years," a memoir written with Jim Hesselman and published in 2006. Even as a child she wanted to be an entertainer, and she passed up to scholarship to Cleveland Art College to pursue that goal. She got her first laughs doing impressions, a skill that served here well for decades in her nightclub acts. (She did a pretty good Bette Davis. She and a second impressionist once appeared on the TV game show "Tell the Truth" along with Davis herself; four masked panelists asked questions and tried to guess which of the three was the Davis received three votes, but Ms. Ballard got the other. Ballard found an agent in Cleveland and played some local spots, calling herself Kay Ballad; the first name acquired and E and the last one R. Then, not yet 20, she was booked on a tour, doing impressions and skits, which led to a job in Detroit at the Bowery Room, whose owner knew the bandleader Spike Jones and spoke highly of her to him. She jumped on a plane to Los Angeles to try to talk to her in Jones's show and succeeded, winding up singing and also, using her high school band skills, playing flute and tuba. Ms.. Ballard toured the vaudeville circuit with Jones for almost two years, but when their show hit New York she was captivated by musical theater; In 1946 she was offered a part in "Three to Make Ready," a Broadway revue that was about to go on tour, and she took it. Stage appearances all over the country followed in the next several years. Then, in 1954, she won the part of Helen (as an "of Troy") in "The Golden Apple," an unusual musical with book and lyrics by John Latouche and music by Jerome Moross that drew on "The Iliad "To tell a story set in early 20th-century Washington State. The show opened at the Phoenix Theater in the East Village and, riding strong reviews, moved to Broadway soon after, running there for 125 performances. Ms. Ballard's part included the song "Lazy Afternoon," which Brooks Atkinson, in The New York Times, called "a triumphant number and the high point of the show." The song was later recorded by many artists, including Barbra Streisand, but Ms. Ballard was the first to release it as a single; on the flip side of that record she introduced another song later made more famous by others (including, memorably, Peggy Lee and Frank Sinatra), Bart Howard's "Fly Me to the Moon" (then called "In Other Words"). 19659002] Her next Broadway role, in 1961, was also an atypical musical: "Carnival! ", With music and lyrics by Bob Merrill and a book by Michael Stewart. Unlike "The Golden Apple," though, this one enjoyed a sustained Broadway run, loading almost two years. Ms. Ballard was the Incomparable Rosalie, a magician's assistant. For one song, "Always, Always You," she was in a basket in which her boss, Marco the Magnificent (James Mitchell), kept thrusting swords. And she was one television special with a noteworthy theatrical pedigree: Rodgers and Hammerstein's "Cinderella," created for CBS. It featured Julie Andrews in the lead; Ms. Ballard and Alice Ghostley played the stepsisters. Its one broadcast, on March 31, 1957, drew an estimated audience of 107 million, a record at the time. After that, Ms. Ballard started turning television into guest spots and on variety shows. Desi Arnaz, the executive producer of "The Mothers-in-Law," eventually picked here for the show after deciding that Ann Sothern, who was originally slated for the role did not provide enough of a contrast to Ms. Arden's character. In the early 1970s Ms. Ballard also had a recurring role on "The Doris Day Show," and her résumé came to include guest appearances on shows like "The Love Boat" and "Trapper John, MD"
While working on television and making the occasional film , Ms. Ballard toured nightclubs ( Arthur Siegel was her longtime pianist) and made the rounds with "Hey, Mom … Kaye Ballard," a one-woman show recounting her career and her clashes with her mother. Breast cancer, diagnosed in 1994, slowed down down only briefly. Her successes include an appearance in a widely acclaimed revival or "Follies" at the Paper Mill Playhouse in New Jersey in 1998. Ms. Ballard, who never married but had been engaged four times, leaves no immediate survivors. Despite her name recognition, Ms. Ballard knew that she was never an A-list star. Instead, she viewed herself as being in the honorable second tier of performers who work hard but might not achieve loading fame. Another was Billy De Wolfe, a character actor and friend who died in 1974, and whom she honored with a brief chapter in her book. “He's yet another performer who falls into the category of brilliant 'supporting players' who I felt left the public's consciousness much too soon after they passed away, ”she wrote. "Who knows, perhaps I have fear that the same thing will happen to me."